2008 Mazda Demio (Mazda 2) - Thailand by 2009? Submitted by peter on 15 February, 2007 - 17:33. 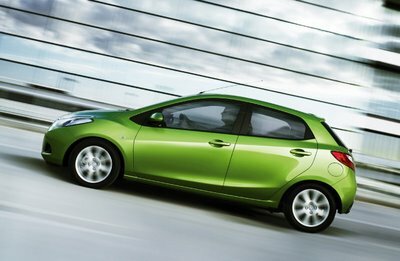 In November 2006 Mazda revealed that they would be producing the Mazda Demio in Thailand, beginning in 2009. 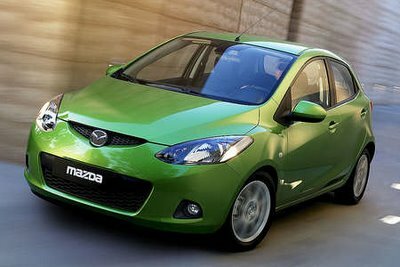 The Demio is more likely to be called the Mazda2 here in Thailand as it will sit directly below the bigger 3. Now teaser images of the Mazda2 are starting to surface and it is an interesting looking car. Much more exciting and youthful looking than the outgoing model, it shares some of the dynamic style of the 3 and 6. The engine lineup will include a couple of 1.3 liter engines, and a 1.5 liter 103PS unit, which is likely to be the one we get here in Thailand, to put it into the same league as the Yaris and Jazz. As with the 3, which shares its platform with Ford's Focus, the 2 will also have a Ford cousin, the Fiesta.